When a company reviews its annual Profit & Loss statements (P&L), three categories typically stand out, thus raising the proverbial red flag – advertising, travel and office supplies. Not surprisingly, all three categories are controllable with determination, careful planning and, of course, organization. I’m not here to tell you how to read a P&L statement nor am I here to tell you how to run your business, but I am here to tell you how to save time and money by keeping your office supplies organized. Clean & Cull: The only way to organize your office supplies – and keep them organized – is to completely empty out the areas (shelves, rooms, closets…) where you store the supplies and take an inventory of what you have and don’t have; what you need and what you don’t need. If you store office supplies in multiple places, gather everything in one place and start separating “like” items into piles on a flat surface so you can actually see what you have. Pitch & recycle: Get rid of obsolete office supplies, such as: typewriter ink cartridges, carbon paper, pink telephone message pads and spiral phone message books, fountain pen cartridges, adding machine paper (unless you’re an accountant), fax machines and thermal fax paper, reams of ledger and legal-sized paper, chalk and chalkboards, floppy disks, tape recorders and answering machines and the small cassette tapes that came with them and dictionaries and thesauri. Pretty soon DVD’s and CD’s will be on the list, but until the time comes, it’s best to order small quantities of these items rather than in bulk. Organize: Put things away in a logical and easily accessible manner. For example, it’s best to keep larger items like paper, boxes of envelopes and pads on the lowest shelves; smaller supplies, which should be containerized in clear storage containers with distinctive labels, should be kept at eye-level where you can actually see what you have and what you need to order. At all costs, avoid using the tippy-top shelf (supply purgatory) for storing office supplies. I suggest taking photographs of the finished shelves so that everyone knows exactly where everything belongs. Orderly & Ordering: When ordering supplies, the K.I.S.S. rule works best. An old-fashioned clipboard and yellow pad are the perfect way to keep track of what needs to be ordered. To ensure you don’t order something that’s already on order, always double-check the handwritten list against the actual inventory and then cross-reference those items against what’s already been ordered. Once an item has been ordered, be sure to initial and date the list to avoid ordering the same item twice. Another way to keep office supplies in check is to assign one person the job of maintaining the closet and ordering the supplies. Bugs & bunnies: When the office supply order arrives, immediately pitch all of the excess plastic wrap cardboard boxes before putting anything away. Cardboard boxes, especially corrugated ones, offer the ideal environment for cockroaches, silverfish and other bugs to hide and breed. Be sure to keep the floor clear of all boxes, as dust bunnies like to harbor behind boxes. Label & Lock: Call me crazy, but I can’t imagine life without my trusty label maker. If you do nothing else, buy a hand-held label maker, such as a Brother P-touch with a QWERTY keyboard, and use it to label where everything is supposed to go. 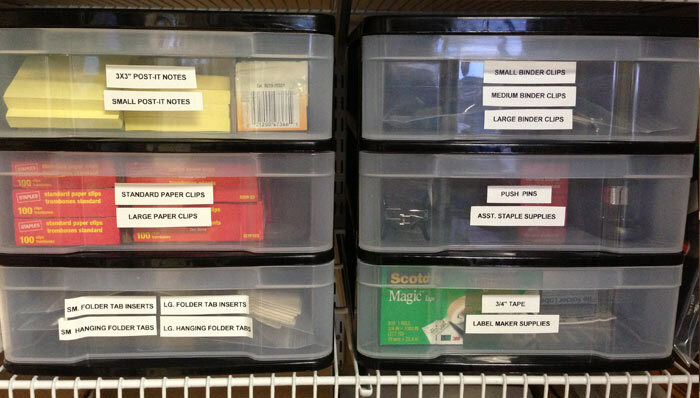 Another sure way of keeping the supply closet neat and orderly is to put a lock on it – I’m not kidding! As computer savvy and paper-free as I am, there’s one “old-fashioned” office supply I refuse to give up and that’s my Rolodex rotary business card holder. That sucker holds more secrets than a vault in Vegas and is destined to accompany me to the grave!